When Paul Buchheit was at Google he was credited with coining the company’s unofficial slogan, “don’t be evil.” Now he’s at Facebook. Things change. Today, at Facebook’s f8 conference in San Francisco, Buchheit’s FriendFeed co-founder Bret Taylor (both came over to Facebook after the acquisition) took the stage to show off a major new Facebook feature: a Like button for the web. Taylor announced that these buttons were ready to be implemented on sites across the web starting today. 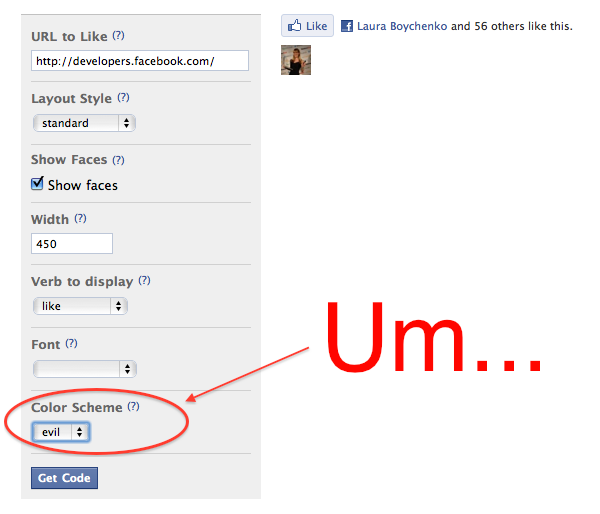 But as you’ll notice on this page, there’s a rather interesting option when you’re customizing the button. 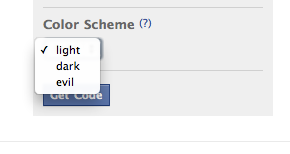 There are three different color schemes you can choose for this button: light, dark, and… evil. Yes, evil. Update: And like that… it’s gone. You’re welcome Facebook.